Stretch your dollar by picnicking! Bring Yer Own: Picnicking is the single best way for travelers to save money…but just try to find strong, lightweight utensils when you need them! Perfect for Two: Our nearly indestructible set includes a handy compact corkscrew, two forks, two teaspoons, and two bread knives. 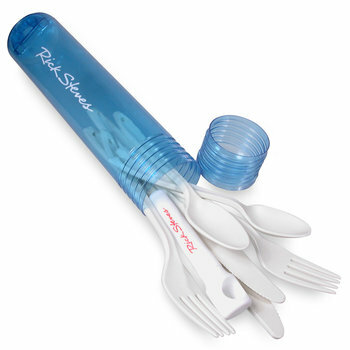 Clever Case: The reusable case screws shut to keep your clean (or dirty) utensils separate from your other belongings. Not Too Sharp: The corkscrew and knives in this set are designed to comply with carry-on requirements.